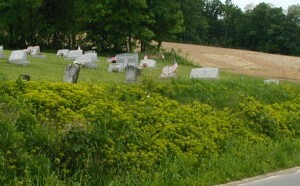 Every year we see what appears to be yellow-green flowers at the roadside right next to a small cemetery. These curious plants come up every year on the slope of the hill going up to the cemetery. Yellow-green plants on hill at cemetery. Roadside view of yellow-green plants. I finally stopped to take a closer look this May. The yellow-green flowers cluster at the top of the stem. 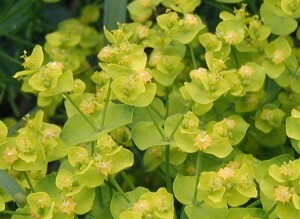 Clusters of Cypress Spurge flowers. The many linear leaves alternating up the stout stem are characteristic of Cypress Spurge, Euphorbia cyparissias. Just underneath the flower cluster is a whorl of slightly longer leaves. 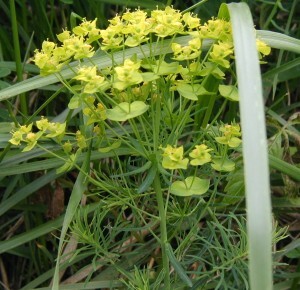 Linear leaves under the yellow-green cypress spurge flowers. Note the many stem leaves and whorl of leaves at the base of most of the flower stems. What appears to be yellowish-green petals tied at their bases are actually bracts. The flowers have no petals or sepals and are very small, less than 1/4 inch wide. Close look at the inconspicuous flowers of Cypress Spurge. 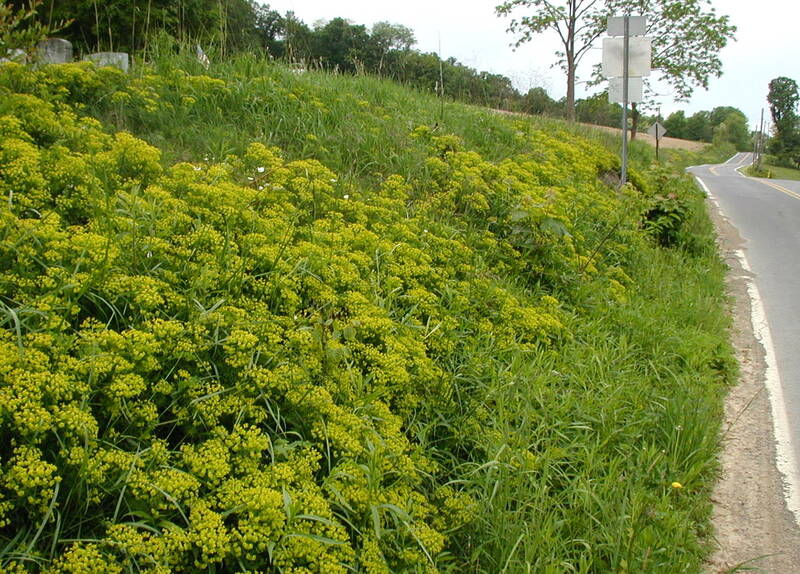 A roadside alien from the Spurge Family, Euphorbiaceae, Cypress Spurge grows in waste areas, such as roadsides, vacant lots, and in this case, near a cemetery. I found it curious that Peterson’s Wildflower Guide mentioned cemeteries specifically as one of the places this spurge plant grows. It turns out that Cypress Spurge is actually referred to as Graveyard Weed because it often occurs in country graveyards. 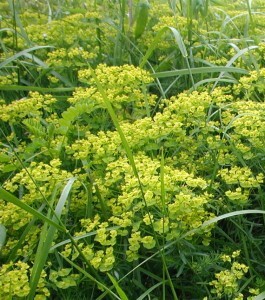 Cypress Spurge is considered by three states to be undesirable. 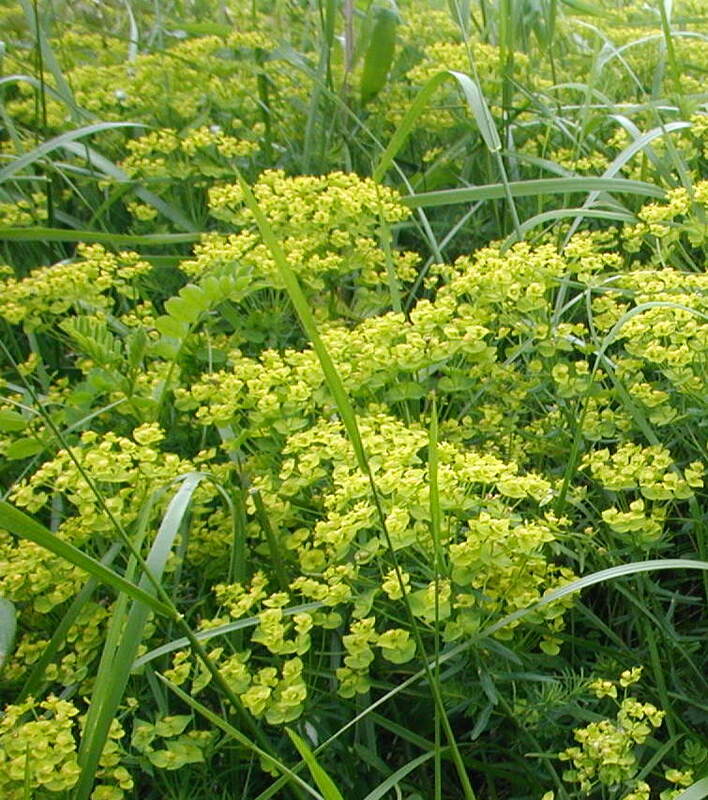 It’s prohibited in Massachusetts, listed as potentially invasive and banned in Connecticut, and it’s on the noxious weed list for Colorado.